This workshop is intended to provide expert tutorials to get you started and show what can be achieved with the software. 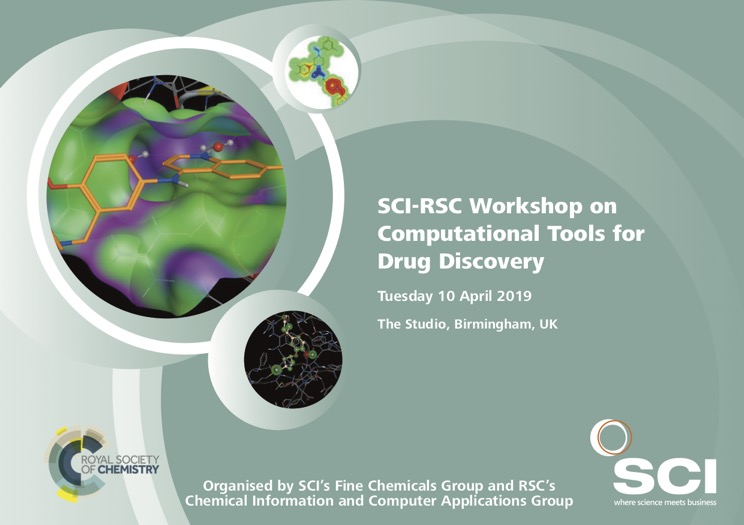 The Chemical Information and Computer Applications Group (CICAG) is one of the RSC’s many member-led Interest Groups, which exist to benefit RSC members and the wider chemical science community, and to meet the requirements of the RSC’s strategy and charter. 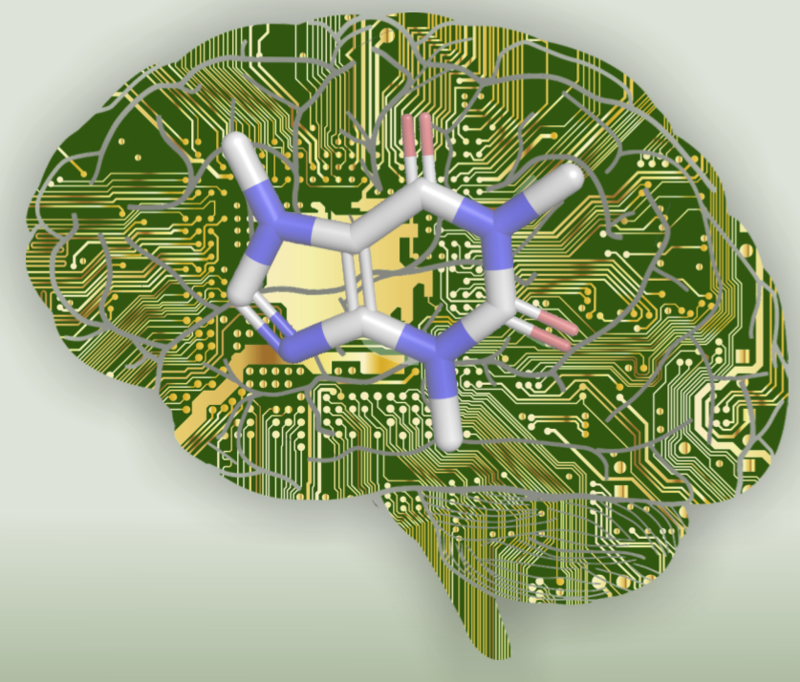 The storage, retrieval, analysis and preservation of chemical information and data are of critical importance for research, development and education in the chemical sciences. All chemists, and everybody else who works with chemical substances, need tools and techniques for handling chemical information. If you have already submitted your form you can make a request to join a group via email (membership@rsc.org) or telephone (01223 432141). If you want to find out more about CICAG activities the newsletters are available here and if you have ideas for future activities feel free to contact the committee. 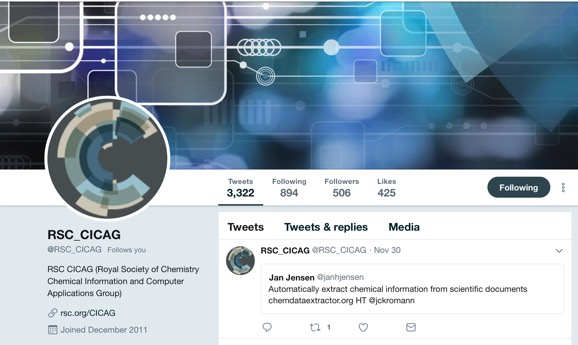 The website for RSC Chemical Information and Computer Applications Group (CICAG) has undergone an update http://www.rsccicag.org now includes more information on forthcoming events and awards, together with the latest CICAG newsletter. Please feel free to share. Why not have a browse around and let us know what else you would like to see included. The Winter 2017-18 edition of the CICAG Newsletter has been published and can be downloaded from the Newsletters webpage. Did you know that most CICAG sponsored meetings have a number of bursaries available for PhD and post-doctoral students? Normally up to a value of £250, these awards help to cover registration and travel costs. Preference will be given to members of the RSC (and meeting co-sponsors if applicable), especially those who are selected to give posters. 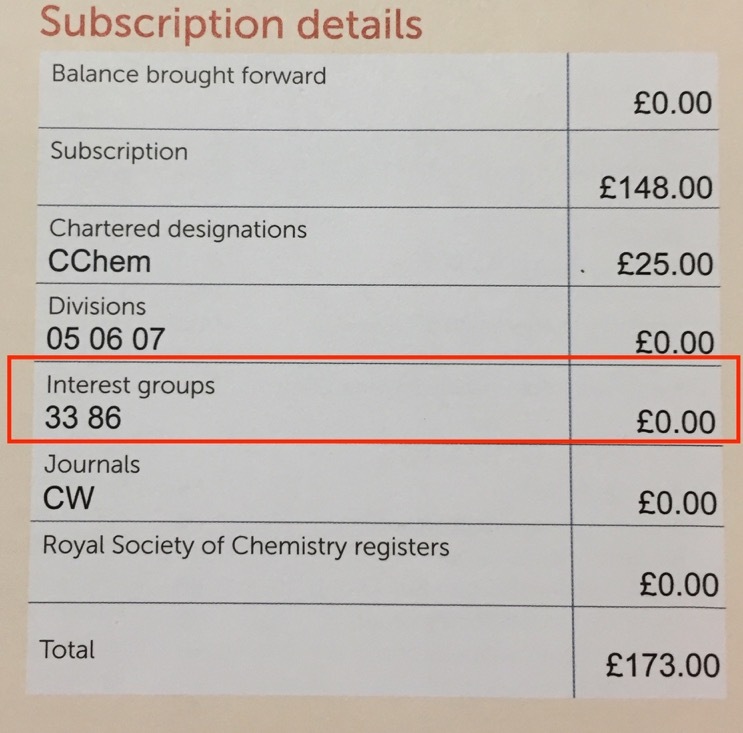 If you are a Royal Society of Chemistry member renewing your annual mebership, can I remind you that your membership entitles you to membership of up to THREE Interest Groups. Apparently only around 25% take advantage of this option so I'd urge you to have a look at the groups available. The first announcement of a CICAG/BMCS meeting to be held next year. 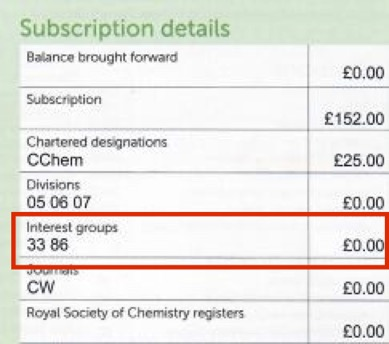 Royal Society of Chemistry members will be getting their annual subscription details around now. Can I remind people that your membership entitles you to membership of up to THREE Interest Groups. Currently it seems Members who wish to change/join interest groups and divisions currently need to request this via email (membership@rsc.org) or telephone (01223 432141). CICAG also organises a number of meetings each year at which members get reduced rates. Details of previous meetings are here. You can also follow CICAG on Twitter https://twitter.com/RSC_CICAG or LinkedIn https://www.linkedin.com/groups/1989945. The 2017 Summer Newsletter is now available for download. This includes reports from the scientific meetings supported, and details of potential future meetings, together with news items that might be of interest to members of RSC CICAG interest group. 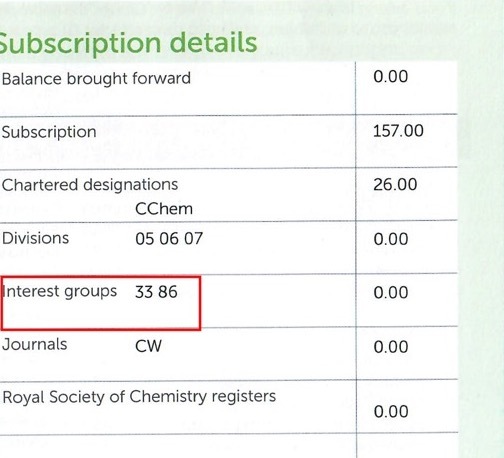 The Chemical Information and Computer Applications Group (CICAG) is one of the RSC’s many member-led Interest Groups. UKeiG presents the Tony Kent Strix Award in partnership with the International Society for Knowledge Organisation (ISKO UK) and the British Computer Society Information Retrieval Specialist Group (BCS IRSG). The award is sponsored by the Royal Society of Chemistry Chemical Information & Computer Applications Group. The Tony Kent Strix Award is given in recognition of an outstanding practical innovation or achievement in the field of information retrieval in its widest sense, including search and data mining, for example. This could take the form of an application or service, or an overall appreciation of past achievements from which significant advances have emanated. The award is open to individuals or groups from anywhere in the world. The deadline for nominations is Thursday 31st August 2017. A sustained contribution over a period of years to the field of information retrieval for example, by running an information service or by contributing at national or international level to organisations active in the field. Key characteristics that the judges will look for in nominations are innovation, initiative, originality and practicality. Additional material (e.g. letters of support - letters from past winners would be especially valuable). It is possible that the Award Committee will request additional information from the nominators for those nominees considered suitable candidates for the award. 86 Chemical Information and Computer Applications Group.